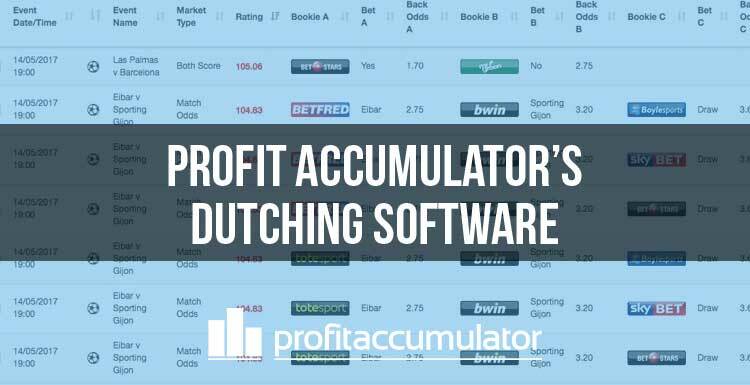 Profit Accumulator's dutching software makes this type of matched betting even easier. Instead of backing and laying with a bookmaker and exchange, the dutching software helps members cover all outcomes with bookmaker bets. Like the oddsmatching software, the dutching software shows the rating for each set of bets, and lets the user know how much to stake with each bookmaker. The dutching software can be used for football, tennis, rugby league, basketball, baseball and American football. Dutching is a betting system that involves staking different amounts on several selections to guarantee a profit (or, for matched bettors neutralise any qualifying losses). An example would be dutching Manchester United v Arsenal. If the odds were right, it might be possible to back United to win with Bookie A, the draw with Bookie B and Arsenal to win with Bookie C, to return a profit or low qualifying loss. Dutching can be used to trigger a bonus such as a free bet, or as a great tool for mug betting. The dutching software can also be used for your free bets. An example would be betting on Over 2.5 goals with one bookmaker, and under 2.5 goals with another bookmaker. If the odds were in the right place and you got your stake amount correct, you could place bets on both of these outcomes to cover yourself against either event. Similarly, you can also have dutching on outcomes with more than two events (for example, betting on the result of a football match). In this instance, you would end up with three bets - one on each of the outcomes. The name "dutching" is thought to relate to American mobster Dutch Schultz. Schultz, whose real name was Arthur Simon Flegenheimer, lived in New York in the early 20th century. One of Schultz’s rackets was a racetrack and he is credited with conceiving the idea and using the dutching strategy. Working out how much to stake on each outcome - and whether the bets are even worth placing - can be a complicated and lengthy process. Our dutching software takes all the work out of it, by showing close matches and how much needs to be staked on each outcome. It works just like the normal oddsmatcher - except that the result for each bookie is visible. The results can be filtered by sport, market type, by bookmaker, rating minimum and maximum and by timeframe. It is compatible with the calculator, to allow users to see how much to stake on part of the bet. There is also a link to each bookie website to make the process quicker. There is also the option to check 'round stake', which will help reduce the risk of being gubbed by your bookmaker. Profit Accumulator members played a key role in the development and improvement of our dutching software and we are grateful for their feedback. Here's what a few of them had to say. "Quality - gotta love new toys." "I spend a lot of time manually dutching sport and this is going to save me a lot of time and effort." "The dutching software does all the work for you, this is a great addition."